How does the throttle spacer kit work? This spacer kit is designed to eliminate the play/slop in the stock ride-by-wire throttle assembly of most modern Ducati and Triumph models. The stock throttle assembly allows for several degrees of rotation of the throttle tube with zero throttle response, and no signal being sent to the ride-by-wire system. These spacers are designed to fit over the nubs in the throttle assembly to take up the extra physical slack, resulting in a hair-trigger throttle that experienced riders will find significantly more responsive and easier to modulate. This kit is guaranteed to improve the accuracy of rev-matched downshifts, and allows for greater control of on/off throttle transitions. You're crazy! The slop is there for a reason! Ducati & Triumph designed the throttle to feel and behave like a traditional cable setup, which always has a bit of cable slack before being pulled taut. Certain international markets also require that the throttle has some slack, so they produce all the bikes that way, for homologation purposes. There's absolutely no benefit for this slop in a ride-by-wire setup, and it only creates difficulty in applying smooth throttle input. The kit does not interfere with the computer's ability to read a closed throttle, as evidenced by the thousands of riders using this kit with no reported issues! 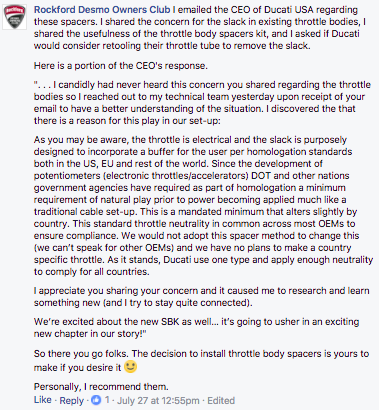 Check out this Facebook post with information direct from the CEO of Ducati USA! What happens if I hit a pothole? Will my bike be uncontrollable? The kit only smooths out the on-off transitions of the throttle. When you're riding around town, the throttle is slightly cracked open. The bike will behave exactly the same going over a bump/pothole whether the spacer kit is installed or not! There's no scenario where additional slop in the throttle is beneficial. Can't I just adjust the throttle cables to remove the slack? No, as these bikes don't have any throttle cables! The system is entirely electronic, and the only way to remove that slack is to fill the gaps inside the throttle housing. Is the throttle spacer kit safe? No failures of the throttle spacer kit have been reported in many months of testing and real-world use. However, installation of this kit will result in a super-responsive throttle that less experienced motorcyclists may find difficult to control. Installation could also result in a stuck throttle that could lead to a crash. This kit is meant for experienced riders looking for instantaneous throttle response. The user assumes all liability for their safety when using this kit. How is the throttle spacer kit manufactured? The kit is manufactured via a precision injection molding process with high grade polypropylene material selected for its particular combination of flexibility and strength. The material allows for enough flexibility to form a very tight fit over the nubs inside the throttle housing, while still maintaining enough stiffness for instantaneous throttle response. Is the kit difficult to install? The kit comes with a four-page, full color installation guide with step-by-step instructions detailing the entire installation process. The installation can be performed with basic hand tools in less than 15 minutes. Required tools are a flathead+Phillips screwdriver, and a hex bit driver with special security bit (included in the kit!). Will installation of the spacer kit void my warranty? No! There's no modification you can do to your bike that will void your warranty. If your dealership is telling you this, then they're dishonest, and you should find a new dealer. Unless a failure on your bike can be directly attributed to an aftermarket modification, the warranty will be fully honored. Do you ship internationally? What about customs fees? Yes, we ship our kits to most international destinations for a small added cost via USPS First Class International or USPS Priority International. Your kit will be shipped with a low claimed value to avoid high customs fees! Ready to buy? Ducati Throttle Spacer Kit, Triumph Throttle Spacer Kit, or Bundle!